In November, for John's birthday, I made him a vanilla almond birthday cake with butter cream icing. It was a perfect cake with the frosting perfectly swirled. I had never made such a perfect cake. I even stuck two Reese's peanut butter cups on top (they are his favorite candy). I then left the kitchen to do other things in the rest of the house. 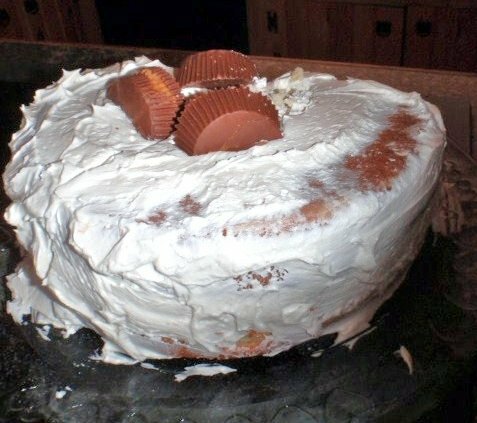 Later, John went into the kitchen and asked me why I had not frosted the cake. But I had and I rushed out to see what he was talking about. The cats! They had gotten onto the counter, all of them, and licked the frosting off of half of the cake! We ate the cake (those of you with cats understand this; those of you without cats no doubt think it disgusting). But we had to continuously hide it from the cats. My cats have never (hardly ever) stolen food from the kitchen counter. Even Pansy the Crippled Cat managed to get up to get her licks in! So why this frosting? It is pure butter and sugar. The recipe is here on my recipe blog. John likes this recipe because it is not sickening sweet. I guess the cats agree with him. I have lost the cake recipe so I cannot share it with you. I also can never make it again until I find it. Hee-hee! I can really sympathize. Cats will get into stuff when you least expect it. Herman has jumped up and stuck his face in the margarine tub. Oh noes! My Mommeh would still eat the cake though. Definitely.